The earthquake again rocked Lombok on Sunday, August 19, 2018. In 2 weeks, Lombok was rocked by three major earthquakes. Among them on July 29 at 05.47 WIB at 6.4 SR, 5 August at 18.46 WIB at 7.0 SR, and August 9 at 12.25 at 6.2 SR.
Until Sunday (12/8/2018) there have been 521 aftershocks. Many people have broken bones because of collapsed buildings. Most experience head and foot injuries. A total of 67,875 housing units were damaged. Not only that, 13 hospitals and health centers, 65 mosques and musholla, and 468 schools were damaged. Severe damage occurred in the cities of Mataram, North Lombok and East Lombok. The Emergency Response Team Aksi Cepat Tanggap has expanded the range of post-disaster handling areas by building 7 evacuation posts in Lombok. c. Health services and logistical needs. 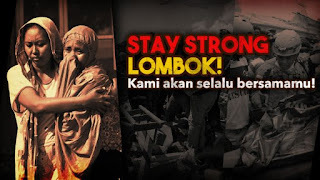 Stay Strong Lombok, We will always be with you..
Visit https://kitabisa.com/korbangempalombok & Click "DONASI SEKARANG"